With all the hype and expectations surrounding the Detroit Lions coming into this NFL regular season, Matthew Stafford and company finally were considered a force to be reckoned with in the NFC Conference, but many people weren’t expecting the up-and-coming Lions to start the year off with a 5-0 record. After a flawless five games for the Lions, Detroit proved to be the real deal and a serious threat to the defending NFC North division champion Chicago Bears and the reigning Super Bowl champion Green Bay Packers. Unfortunately, the Lions getting off to a red-hot start were a bit premature in terms of labeling this team a playoff contender or possibly a Super Bowl title contender. There was no question that the struggling Detroit Lions franchise had finally turned the corner and gotten the kind of production they were looking for out of emerging superstars Matthew Stafford and Calvin Johnson, but a loss to another up-and-coming team in the San Francisco 49ers (25-19) in Week 6 was a wakeup call. The game went down to the wire with both teams having an opportunity to win, but in the end the resurgent 49ers came out on top. This loss to the San Francisco 49ers was just the first of two straight losses for the Lions as in Week 7 the Detroit squad lost their second game of the season to the Atlanta Falcons (23-16) in similar fashion. Fortunately, the Lions did get back on track in Week 8 with a blowout win over Tim Tebow and the Denver Broncos with an impressive offensive display in which Detroit lit up the scoreboard for 45 points while holding Denver to just 10 points. The win over the Broncos was thought to get the Lions right back on track, but just a week later they fell to the division rival Chicago Bears (37-13). The loss to Bears wasn’t a big surprise as it was the first lockdown defense the Lions had faced this season. In Week 11, the Detroit Lions wanted to get back on track once again as they hosted rookie phenom Cam Newton and the surprisingly good Carolina Panthers. Even though the Panthers had only won two games all year, the Lions were taking this team lightly as Carolina has given every team they have faced this season a run for their money, including the defending Super Bowl champion Green Bay Packers. With that being said, this was not going to be an easy win for the potent offense of the Detroit Lions as the Carolina Panthers had the ability of pulling off the upset. This game was a shootout from start to finish with Matthew Stafford and Cam Newton battling it out back and forth. 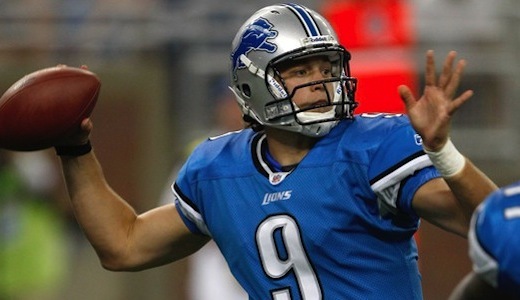 Fortunately for the Lions, Stafford came out on top in this one by throwing a season-high five touchdown passes to go along with a game-high 335 passing yards. Not only was Stafford on his game in Week 11, but the Lions ground game got a big boost from running back Kevin Smith who rushed for a game-high 140 yards and scored two rushing touchdowns. « Are the Dallas Cowboys playoff bound this season?